Some clouds. A stray shower or thunderstorm is possible. Low 52F. WNW winds at 15 to 25 mph, decreasing to 5 to 10 mph.. Some clouds. A stray shower or thunderstorm is possible. Low 52F. WNW winds at 15 to 25 mph, decreasing to 5 to 10 mph. One plant produced these bright white poppies next to its orange neighbors. Sometimes the outside of the petals have an airbrushed-looking blush. A single snow white poppy flower. You never know where white poppies might appear. These showed up along my brother's driveway. As our state flower, the California Poppy (Eschscholtzia californica) has been reproduced in countless images, graphics and depictions, virtually always in bright orange. If you love these iconic flowers and explore them more, however, you will find quite a bit of variation. Some of them are a pale lemon yellow, especially later in the season, and others are as white as snow or milk. Others have a faint reddish blush on the outside of their four petals. These are simply natural mutations that often arise and disappear among colonies of orange poppies. Horticulturalists have often cultivated and perpetuated these different colored mutations, and you can buy seeds to grow your own white poppies, or even ones that are yellow or red. You can save seed from wild plants that have unusual colors, but the resulting plants typically don't retain the unique color, because the flowers were pollinated with pollen from their more typically-colored neighbors. It is always a fun discovery to find these aberrant shades growing in colonies of more conventionally orange poppies. Over the years I've photographed some of these pale versions, and when I returned to the same location in succeeding years, they sometimes would show themselves again but eventually were gone. It hardly needs to be said, especially in a much-discussed "Superbloom" year like this one, but the California Poppy is a superlative flower. They are without equal in many respects. I'd like to share what some botanists from the past said about them. 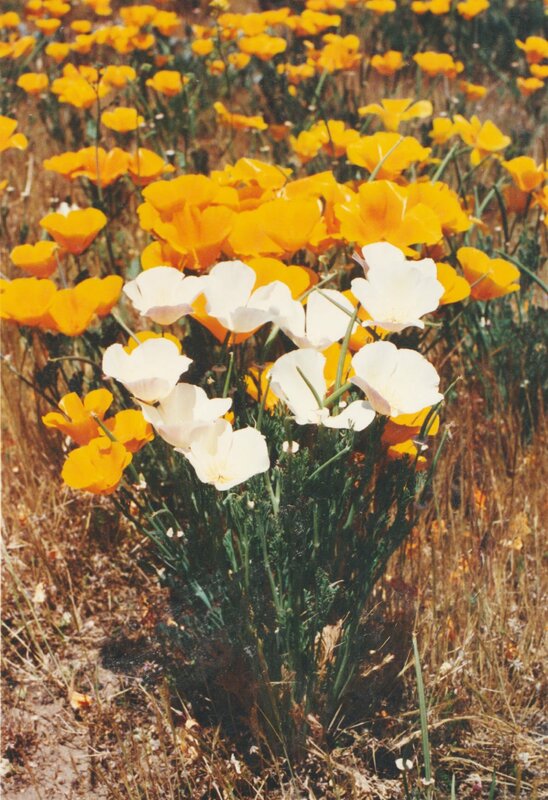 Mary Elizabeth Parsons, who published the splendid book "The Wild Flowers of California" in 1906, had this to say about poppies: "It is difficult to exaggerate the charms of this wonderful flower. When reproduced in countless millions, its brilliant blossoms fairly cover the earth; and far away upon distant mountain slopes, bright patches of red gold denote that league after league lies open to the sun." She added: "This flower is now cultivated in many parts of the world. But one can form no conception of it, pale and languishing in a foreign garden. One must go to the native hillsides to get any idea of its prodigal beauty." In dramatic California fashion, the bookplates for Mary Parsons' wildflower guide were sitting in the pressroom at her San Francisco publishing house on the morning of April 18, 1906, when a massive earthquake shook the city, and they were destroyed in the ensuing fires that ravaged San Francisco over three days. Happily for Ms. Parsons, new bookplates were made and she was able to make some additions and improvements that her male publishers had previously resisted. Another beautiful quote about California Poppies comes from the late botanist John Thomas Howell, who wrote this: "No poet has yet sung the full beauty of our poppy, no painter has successfully portrayed the satiny sheen of its lustrous petals, no scientist has satisfactorily diagnosed the vagaries of its variations and adaptability. In its abundance, this colorful plant should not be slighted: cherish it and be ever thankful that so rare a plant is common." Amen, brother. 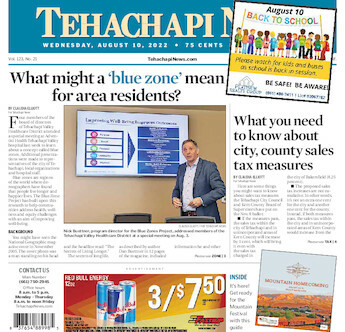 To see some great expanses of poppies in the Antelope Valley, I recommend taking Tehachapi-Willow Springs Road to Avenue D (Highway 138) and then turning right. Drive until you see expanses of poppies. You can access them from numerous dirt roads. You can also go to the Antelope Poppy Reserve, but the crowds on weekends are ridiculous. You have to go soon though because they will not last. The poppies at our elevations, cheeringly, are mostly still to come.